Centuries ago medical professionals became aware of the connection between yeast infections and much larger underlying diseases such as malignant tumors, diabetes mellitus and chronic infections. Recent studies show that another disease that can be connected with the presence of these infections is Cancer! A recent study, “Candida Albicans and Cancer: Can This Yeast Induce Cancer Development or Progression?”, published in Critical Reviews in Microbiology, addresses the connection between yeast infections and Cancer. The results not only found that the yeast was a by-product of cancer, but that it was actually acting as a contributor to the disease! The impact of Candida during infection on the body is severe, especially in those with compromised immune systems. The infection excretes toxins in the body, that quickly overwhelm the immune system and its attempts to fight the infection off. Not only should medical professionals aim to avoid the presence of Candida Albicans in cancer patients, however it would be beneficial to concentrate further study on the possibility of minimizing its risk and the effect that come from Candida Albicans including the creation of pro-tumor micro-environments through the use of drug treatments. “There is currently increasing concern about the relation between microbial infections and cancer. More and more studies support the view that there is an association, above all, when the causal agents are bacteria or viruses. This review adds to this, summarizing evidence that the opportunistic fungus Candida Albicans increases the risk of carcinogenesis and metastasis. Until recent years, Candida spp. Had fundamentally been linked to cancerous processes as it is an opportunist pathogen that takes advantage of the immunosuppressed state of patients particularly due to chemotherapy. The second study, “Curcumin and Its Promise as an Anti-Cancer Drug: An Analysis of its Anti-Cancer and Anti-Fungal Effects in Cancer and Associated Complications from Invasive Fungal Infections” focused on the healing powers of curcumin, the primary polyphenol found in turmeric. Curcumin has a heightened ability to withstand attacks from free radicals within the body, allowing it to protect the body against fungal infections. “Curcumin, a natural component that is isolated from the rhizome of Curcuma longa plants, has attracted great interest among many scientists studying solid cancers over the last half century. Interestingly, curcumin provides an ideal alternative to current therapies because of its relatively safe profile, even at high doses. To date, curcumin’s potent antifungal activity against different strains of Candida, Cryptococcus, Aspergillus, Trichosporon and Paracoccidioides have been reported, indicating that curcumin anticancer drugs may also possess an antifungal role, helping cancer patients to resist invasive fungal infection related complications. The aim of this review is to discuss curcumin’s dual pharmacological activities regarding its applications as a natural anticancer and antifungal agent. These dual pharmacological activities are expected to lead to clinical trials and to improve infection survival among cancer patients. 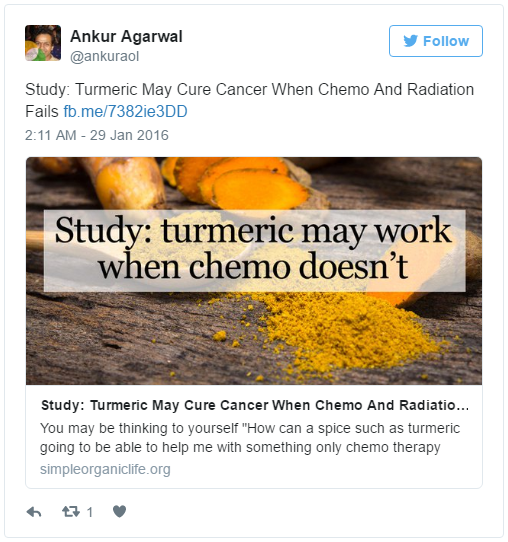 These studies illustrated the power of Turmeric in the fight against cancer. It’s ability to fight fungal infections without the side effects of traditional cancer treatments is worth of further investigation. Previous ArticleScientists Discover Root that Can Kill 98% of Cancer Cells in 48 Hours!